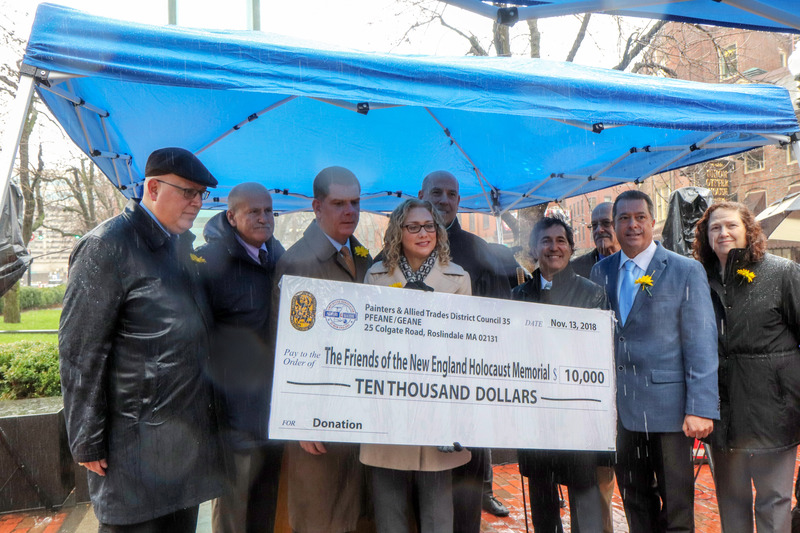 As a steady downpour fell on the New England Holocaust Memorial, leaders of the union responsible for installing the six towers’ iconic glass panels gathered to present a donation of $10,000 to the memorial’s stewards. “It is our moral obligation to stand up and to speak up,” said Wayne Murphy, director of government and public affairs for the Painters & Allied Trades District Council 35, also known as the glaziers’ union. Murphy was referring to the need for community members to respond to acts of discrimination or persecution, he said. Before presenting his union’s check to the Friends of the New England Holocaust Memorial, Murphy spoke about organized labor’s role in bringing the memorial to fruition. Twenty-three years ago, union glaziers created and installed the memorial’s 132 glass panels, each of which is etched with hundreds of numbers intended to evoke the tattoos with which Jewish forced laborers were branded at the death camp Auschwitz-Birkenau. In his remarks, Murphy also noted his union’s response to acts of high-profile vandalism that took place at the memorial last year. At two points during the summer, individual panels were shattered by rocks hurled at them from below. Fortunately, a complete set of replacement panels was created at the time of the memorial’s construction, and the glaziers’ union stepped in to repair the damage. The six towers hovering above Boston’s Freedom Trail symbolize the Holocaust’s 6 million victims, as well as six Nazi-built death camps in occupied Poland. The award-winning memorial complex includes testimony from survivors and a timeline of the Nazis’ persecution of Jews, as well as a section dedicated to American soldiers who liberated the camps. In his remarks to onlookers gathered in the rain, Boston Mayor Marty Walsh referred to “acts of anti-Semitism happening all over our country,” including the Pittsburgh synagogue massacre of Oct. 27, in which 11 Jewish worshippers were murdered. Pointing to lessons drawn from the Holocaust, Walsh praised Boston for its “inclusiveness,” adding that the city’s “past, present and future” are based on immigration. “[This donation] makes me proud to be a member of the labor movement,” said Walsh. Also in attendance to thank the union for its donation were several Jewish community leaders, including Cindy Janower, chair of CJP’s board of directors, and Janet Stein Calm, president of the local survivors’ association. 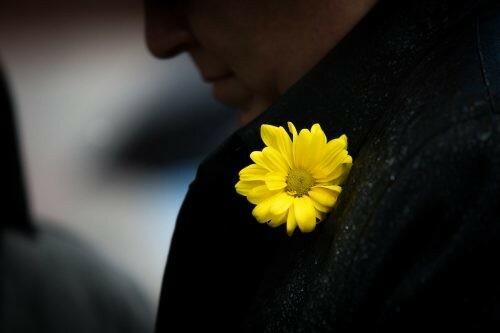 In recent years, CJP has taken over responsibility for maintenance and security at the site, as well as for stewarding the memorial’s endowment. “[This donation] will maintain the memorial in perpetuity, adding to the strength of this sacred place,” said Jeremy Burton, executive director of the Jewish Community Relations Council of Greater Boston. Praising organized labor for its longtime involvement at the site, Burton noted that 2018 is a year of “reconsecration” following last year’s acts of vandalism.